After 3 months of swimming lessons many of the girls now have the confidence to paddle out to the surf charter boats moored 50 to 100 metres from the shore. This is formerly unchartered territory for them and it’s been a novelty for the boat captains who are used to seeing the boys but not meeting the girls! Several of the captains have commented on this new trend and said how great it is to see the girls out in the ocean environment. 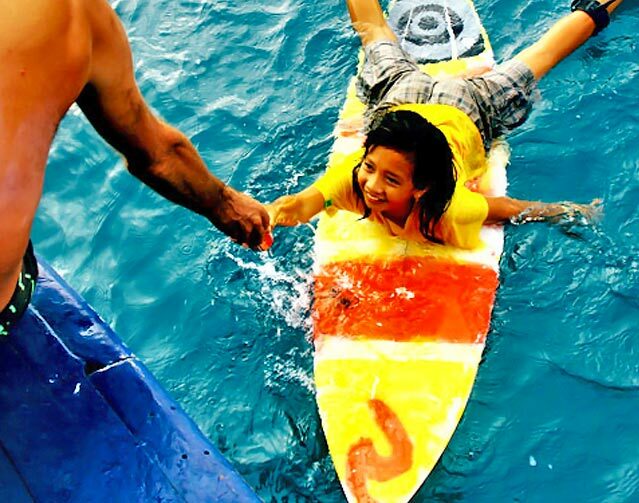 They see it as a positive in many ways – for the health benefits to the girls, the interaction with foreigners and the chance to speak English and get a glimpse of surf tourism as it is on the surf charter boats. The girls are stoked too. And if they’re lucky they pick up a free cool drink here and there too!